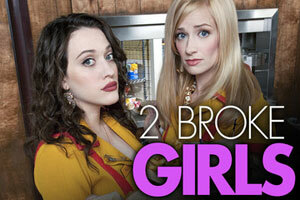 Looking for "2 Broke Girls" Auditions and Casting Calls? Post your profile, photos, resume and videos so you can be discovered by casting directors and talent scouts around the world. You might even get a chance to appear on a TV show like "2 Broke Girls." Sassy, streetwise Max Black works two jobs just to get by, one of which is waiting tables during the night shift at the retro-hip Williamsburg Diner. Sophisticated Caroline Channing is an uptown trust fund princess who's having a run of bad luck that forces her to reluctantly give waitressing a shot. At first, Max sees Caroline as yet another in a long line of inept servers she must cover for, but she's surprised to find that Caroline has as much substance as she does style. While they save their tips, they'll stay at the restaurant, working with Oleg, an overly flirtatious Russian cook; Earl, a 75-year-old kool-kat cashier; and Han Lee, the new, eager-to-please owner of the diner. Working together, these two broke girls living in one expensive city might just find the perfect recipe for their big break. Welcome to the "2 Broke Girls" Message Board - the place to discuss anything and everything about "2 Broke Girls." Hi, my name is Annette I love acting and i would love to be on your show its my dream to act and i need to be able to show my talent im 5 foot and i have dirty blonde hair. I have experience with acting and have been told that i can do it. Male,16,tick(not fat,Not that strong, kinda a mix) I'm looking for something to get me seen even if I'm an extra then that's awesome! I just want people to know I'm out there. You have my E-mail.. E-Mail me if i could be in there thanks. Hi! My Name Is Katie I Am Almost 13 And I Love You Show! I Am 4'9 And Love To Act I Have An Acting Backround With My Faimly Ive Been In A Few Plays But I'd Love To Be On You Show Email Me If I Can!